This past Sunday was the last 20 miles that my shoes will see. It was time to retire those old shoes as they had nearly 500 miles on them. It seemed like I went through this pair faster than any previous pair...... notice I didn't say I ran any faster in them..... just that I went through them faster. I guess that is what marathon training does to a pair of shoes. My new shoes, which I purchased from Gerald AKA RaceSpeed over at www.telarun.com showed up at my doorstep on Saturday with the new pair that I ordered for my daughter who also was in need of a new pair. We both stayed with the same model that we currently ran in, the New Balance 769's. Mine are identical to my last pair, while my daughters are the next 1/2 size up. 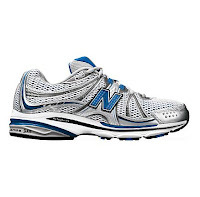 This is my forth pair of New Balance, all within this same model line. 767, 768, 769, 769...... will I ever try another brand or model..... Who knows! We were both starting to feel that it was time to change them out. I was starting to get some ankle pain as well as other misc soreness like in my hips and muscles. This is the same trouble I have started to have each time my shoes were due to be replaced. My daughter was starting to feel pain in her right arch, which we were not sure was caused by the shoes, but it was time for replacement anyway. I decided to hold off and run in my old shoes for my 20 miler on Sunday - not a good run to break in some new shoes. Monday I ran in the new shoes, but without putting my inserts in. I wanted to see the difference. My feet and legs hurt some the rest of the day so Tuesday I went ahead and put in the inserts which felt much better. This week has been a step back week for me in my marathon training schedule so it was a great week to introduce some new shoes. My daughter spent this past weekend in Richmond. VA running the Freshman race at the U.S. Army X-Country Festival at Maymont, one of the premier running festivals in the country. This worked out pretty good as well because Monday she was ready to go with some new shoes. We also are trying her new shoes out without the inserts to see how they feel. She has run the entire week so far without the inserts and they are still feeling good. We will probably for-go the inserts unless at a later time we feel she needs them again. Her arch does seem to be feeling a bit better, but that could also be related to her coach intentionally lowering her miles this week. A friend of mine mentioned that I was probably due for an oil change when he saw how many miles I had been running. To a runner new shoes = oil change. Looking forward to my Half Marathon this Sunday - it is a race, but also just part of my Marathon Training..... I will be blogging about it soon! Thank you for the mention in your Blog. I enjoy the fact that you share "running" with your daughter. Reminds me of my son and daughters start in running and forming their own identities with such a healthy endeavor. I must look for some pix of their early running days to share with you. hooray new shoes! hope your half goes well tomorrow!